"Every year for the past fifty-four years, the residents of Pinsbury Port receive a mysterious letter inviting all eligible-aged boys to compete for an esteemed scholarship to the all-male Stemwick University. Every year, the poorer residents look to see that their names are on the list. The wealthier look to see how likely their sons are to survive. And Rhen Tellur opens it to see if she can derive which substances the ink and parchment are created from, using her father’s microscope. With her cousin, Seleni, by her side, the girls don disguises and enter Mr. Holm’s labyrinth, to best the boys and claim the scholarship prize. Except not everyone’s ready for a girl who doesn’t know her place. And not everyone survives the maze." To Best the Boys was an unexpected delight that I had such a fun time reading! Going into this book, I knew the premise sounded like something I would love--girls proving themselves against boys, mazes and labyrinths, riddles, etc., all things that I love, but I had no idea if it would be executed as well as I hoped and I'm so glad to be able to say that it was. 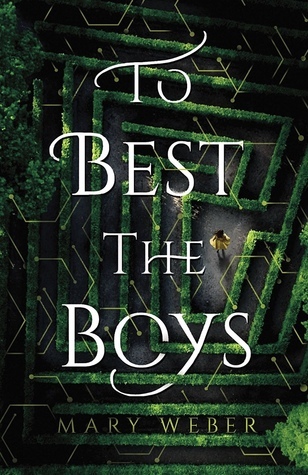 As the premise explains, To Best the Boys centers around a mysterious, potentially deadly maze-like competition in which the winner receives a scholarship to attend a highly acclaimed (all male) university. Despite the fact that the main event of this book is the maze competition, there are still many other components--such as class struggles, women's right, and more--that make up the bulk of the story. I loved the creativity and development of the maze and how Weber made everything work together into one cohesive plot. The characters were really varied throughout the book and I genuinely enjoyed getting to know most of them. Rhen, the protagonist, was particularly promising and endeared me to her almost immediately. I especially liked that she seemed to really know what were and weren't her strengths, as she would readily admit that she wasn't good at things that weren't math or science-related. That type of honesty is refreshing to read, especially when it's a character who is constantly trying to prove themselves. I also loved Rhen best friend, Seleni, largely because of what an honest and loyal friend she was to Rhen throughout every moment. The two friends never gave up on one other and I admired it so much. There were some male characters that drove me crazy in this book with their arrogant attitudes, but I'm pretty sure that they were supposed to so the job was done well. Also, for those wondering: there is some romance in this story, but it is never the main focus and is actually done pretty well in my opinion. Within the labyrinth competition itself were plenty of puzzles that the characters had to solve, so if you're a reader that likes puzzles you'll love solving them along with the characters. I'll admit that I was slightly disappointed because I thought that the main game portion would be longer and a bit different than it was, but I did still really enjoy it. The only other somewhat disappointing part of this book for me was that one main component related to the game that I think was supposed to be a huge mystery, but it was actually something that I predicted extremely early on and that felt slightly cliche'd. One of my hands down favorite things was the inclusion and acceptance exemplified between Rhen and her friend Seleni. I loved that Rhen and Seleni were so unfailingly loyal to one another and that although Rhen was portrayed positively as a scientist who doesn't want anything to do with traditional female roles, Seleni was also portrayed positively as a woman who wanted more than anything to take on the role of wife to her future potential husband and have a 'traditional' woman's role--and both were perfectly acceptable and positive! It's so important to me that any and all life choice made by women are accepted because so often books simply show women who reject 'traditional' female roles as being positive, when in reality there are plenty of women who are okay with those and want those roles. I really just wanted to point that out in this review because it's something that really stood out to me and made me happy to see. Celebrating different perspectives and goals is incredibly important. To Best the Boys covers a lot of different themes from gender roles to mental issues to class issues and so much more, all wrapped up in an exciting story that kept me engaged the entire time.Overall, I had a really enjoyable time reading this book and look forward to seeing what other works Mary Weber has written! I've had my eye on this book, so it's nice to read a positive review. And I'm glad to hear that the author normalizes traditional women's roles! It's all about choice and being able to choose the right thing for yourself.